Shadow awakens with amnesia and is tormented by a dark past as he struggles to unveil his true identity. Was he created to save humankind or to do the evil bidding of the dark side? Only by collecting the seven Chaos Emeralds will Shadow unlock the truth. Caught in a complex battle between aliens, the G.U.N. army, and Dr. Eggman, Shadow becomes the very element that may tip the scales between good and evil forever. The epic is set…and the path that Shadow will ultimately take is completely up to you! Open-ended, story altering choices. Produce positive or dire consequences in Shadow's future by the paths you choose. Have a different experience every time you play! Intense high-speed action! 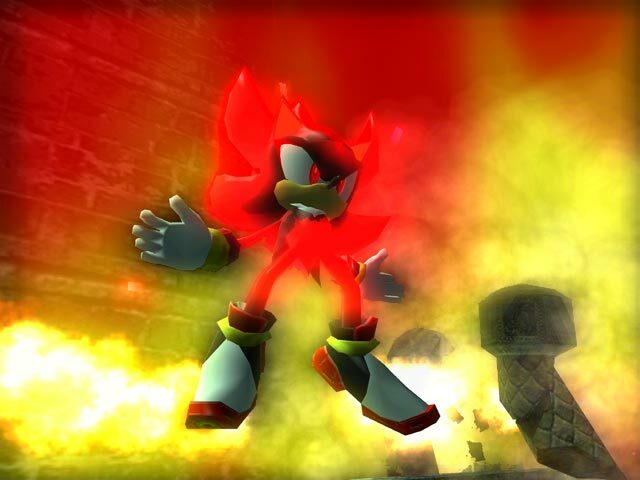 Shadow has amplified speed and firepower, and can manipulate time and space with Chaos Control or create unbelievable destruction with Chaos Blast. Weapons, vehicles, and items! Draw from a huge arsenal of weapons including projectiles, firearms, bazookas, blasters and worm lasers. Speed away on a motorcycle, an alien craft or an SUV. AND, for the first time ever in a Sonic property – pick up and use environmental objects like poles, sticks and debris to plow your way through the mission. An all-star cast of characters! All of your favourite characters from the Sonic series, as well as an interesting line-up of new allies and adversaries! Huge variety of unique and intriguing stages and missions. Over 20 stages and more than 50+ missions. Two-player competitive mode. Get your friends in on the intense action. 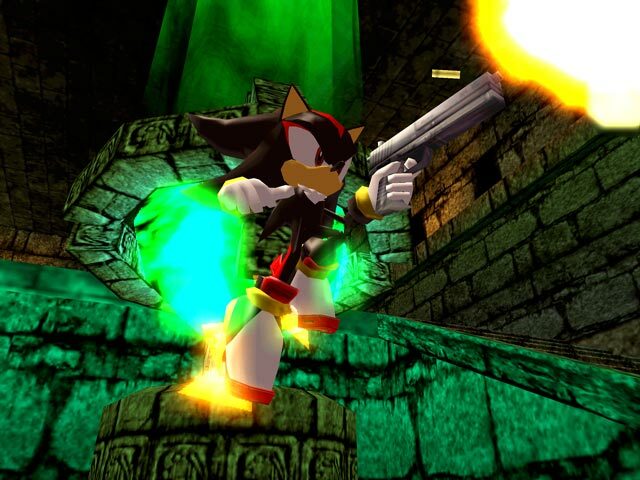 Shadow the Hedgehog transforms players into a dark hero with a mysterious past. Unsure of your characters past, Shadow finds himself suffering from amnesia and unsure whether he was created to save the world or do the evil bidding of the dark side. To make matter worse, the appearance of an alien army called the Black Arms descends upon the world carving a path of destruction who also feature the same black and crimson skin as Shadow himself. Shadow is stunned when the leader recognises him and instructs Shadow to collect the seven Chaos emeralds, which could unlock the truth behind his mysterious past. A large part of Shadow the Hedgehog’s problems stem from the fact that there’s actually some good concepts that are unfortunately left unrealised thanks to the clunky fundamentals. Taking the moral issue of Shadow being unaware whether he’s good or evil, each stage features earth’s soldiers fighting against the legion of Black Arms aliens, in turn defeating opponents from either side will raise one of two gauges which grant Shadow two different special moves when fully replenished. Not only that, Shadow the Hedgehog takes the good/evil concept and expands upon it into a branching narrative which splits based upon the player’s actions on each stage. So despite the good intentions it’s sad to find the core fundamentals severely lacking. 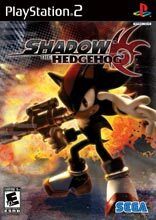 Camera and control have never been successfully accomplished in a 3D title however Shadow the Hedgehog takes the plunge even further by throwing combat into the mix. Much like the Sonic Adventure series it’s hard enough just trying to control Shadow and navigate the platform sections because of the non-existent camera and icy controls, however introducing ranged combat just adds another factor to contemplate. I’ve never been a fan of the idea to put guns in a Sonic title, however the implementation is far worse then I could have possibly imagined. Firstly there’s no auto-targeting option so accuracy is a completely hit-and-miss affair, worsened by the typically loose control problems that thwart the franchise. Secondly, combat breaks up the classic Sonic action into a ponderous stop/start affair that simply isn’t fun. The game certainly isn’t helped by its overly simple visual style, which actually comes across as inferior to the Adventure series which debuted on the Dreamcast. Combine the lack of detail with the atrocious slowdown problems that occur too frequently and the end result is a Shadow that simply looks too old. As a long-term Sonic fan, Shadow the Hedgehog fills me with absolute dread and disdain that gives the Sonic franchise a huge step backwards by negating the core ingredients of the Sonic series. Definitely rent before you buy!